We start with an overview and discussion about how Europe is governed and run, along with a map to help any geographically-challenged American 'punks find their way around. From there, Europe is broken down into regions - the Major Powers, the South, the New Central Europe and the Margins, with plenty of information about each country. Class and Eurostyle then looks at what it's like to live there, and finally there's everything you need presented in a role-by-role basis to find out how you fit in. The first section is Fortress Europe, and this opens logically with how a visitor gains entry to Europe. If you want to do it legally it's simple enough to present ID and other information to an EU Embassy a couple of weeks before you want to travel - just very expensive! It gets harder if you don't have a Corporate passport to present, though. If you travel by recognised routes, your troubles are not yet over. Border security is taken very seriously. They check for illegal cyberware, for starters... thoroughly. Immigration has three channels: EU citizen, Corporate passport-holders, and everyone else. Checks include retina scans and a requirement to sign a document that you are NOT seeking asylum! This takes around three hours at airports, land crossings take far longer. Going across other than at a regular crossing point is a major undertaking. Each nation handles border security its own way, but they do cooperate and have EC resources to call upon. Sea routes are also well-patrolled by people accustomed to taking on heavily-armed smugglers. Next all is explained in Who Runs Europe? Only taxpayers may vote, so if you're unemployed forget it. EC constituencies are based on the tax take, thus giving a small rich area a say equal to that of a large poorer one. Money is at the heart of the power structure. Local politics (at a national level) is about providing services to citizens and attempting to prove that their tax money is being well-spent. There's a lot of detail on the European Council, probably more than most citizens know unless they are really into current affairs. Useful if you fancy a spot of high-level intrigue. It is, of course, corrupt. Plenty money can be made. Groups who like political intrigue and scheming could have an interesting and unusual game, or you may prefer more typically cyberpunk activities driven by politicial rather than corporate in-fighting... or of course when one or more corporation wishes to influence politics. There's an integrated European Defence Force (nations still retain their own military, however), and they - like in the present day - have a migrant problem, with hordes of economic migrants trying to enter Europe from elsewhere without troubling with the nicities of going through proper channels and getting the necessary permits to live and work in Europe. This section gives an excellent picture of how Europe is governed... but has a complete lack of understanding of how to use an apostrophe! Then we move on to the nation-by-nation gazetteer, beginning with The Major Powers (France, Benelux,and Germany). There's a timeline from 1990 to 2020, covering all of Europe in broad strokes but particularly concentrating on this region. For each, we get an overview, then hear about the government, background and culture, and a regional guide. In following sections The South (Spain, Portugal, Italy, Greece, and Turkey), The New Central Europe (Poland, the Czech Republic, Slovakia, Hungary, Romania, Bulgaria, Bosnia-Herzegvina, Serbia, Croatia, and Slovenia) and The Margins (the UK, Ireland, the Scandinavian bloc of Denmark, Finland, Norwary, Sweden, Iceland and Greenland; also Russia and satellite countries, and North-West Africa). Some nations get more attention than others, so you may have to dig around in real-world resources as well to be able to convey a good local feel should the party go there. Next, Class and Eurostyle provides information on various groups such as Old Nobility, Goldenkids, Eurocrats and even Sports Fans... and plenty wierder groups like Goths and Vlads - who believe vampirism is the future and bodysculpt fangs, and come out only at night with long swirling cloaks - and New Templars, who live like mediaeval warrior monks. In general, however, European style is one of sublety rather than brute force. Overt cyberware is right out... but discreetly hidden cyberware is quite popular, also nanotech and bioengineering. We also hear about everyday life, and that despite the EC, most people regard themselves as citizens of a given nation rather than of Europe. Despite this, the EC's tentacles run deep. Don't set foot out without your ID. Entertainment, sports and hobbies are also covered along with education, religion and even pets. Social care is good - on paper. It's a bit soul-destroying in real life, but at least nobody should starve or have no roof over their heads, or lack access to basic medical care. Taxation is complex, and evading it is a fine art. Living costs are also covered here, along with transportation and the law. Non-citizens are normally thrown out of Europe for even minor offences. Finally The Roles in Europe looks at how the various Roles present themselves, and what they do, and how. This is laid out by Role, so it's easy to find out about the Role you want to play. There's a very small amount of information on European Lifepaths... invent your own or seek them elsewhere. Overall, a good look at Europe should you have an adventure that will take you there. Less good if you want to play a character coming from there, the lack of Lifepath information is noticeable although the notes on style are excellent to help you get the look and feel you need. 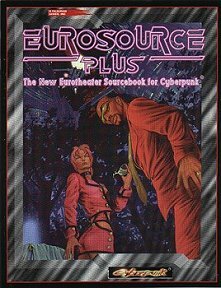 Return to Eurosource Plus page.